Over the past month, I’ve been sketching, browsing, designing and shopping to find all of the perfect items for my NEW NYC apartment and bedroom! I got pretty lucky by finding what’s considered a large room (approx. 14 x 12 feet, yeah seriously!) while the majority of bedrooms are smaller squares like 8 x 10, or oblong like 7 x 13. Best of all, I’m loving my new neighborhood – a great part of the city called Lenox Hill. 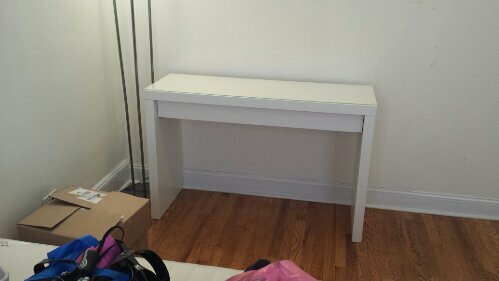 I took this project on with excitement: new furniture, a whole new color scheme, and best of all, a place to myself to decorate, take care of and enjoy. However, I was not as excited when I saw the prices of furniture, bedding, necessities, moving trucks and more. 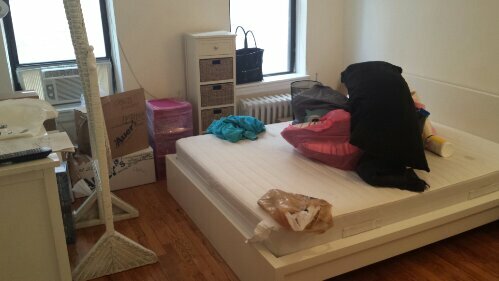 So, I tried to shop logically–a lot of sales and budget buys–and items that would last a few years, rather than so cheap that they fall apart after a few months or a super expensive bed frame or dresser that I might outgrow the style of. The before is not bad by any means, it’s just to show the comparison and how I managed to find my own personal style. 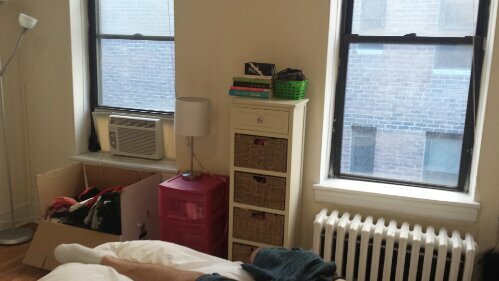 For those curious about where all my shoes and clothes are, I have an alcove with space for 2 shoe racks, a standing wardrobe, laundry hamper and closet outside of the room/in the living room as well. Possibly some pictures of that to come! It had a blue and white color combination with some artsy geometric accents and a lot of shelving! There were a few shelves and bookcases with books, knick knacks and other items plus a mini fridge and a lot of lighting via floor lamps. 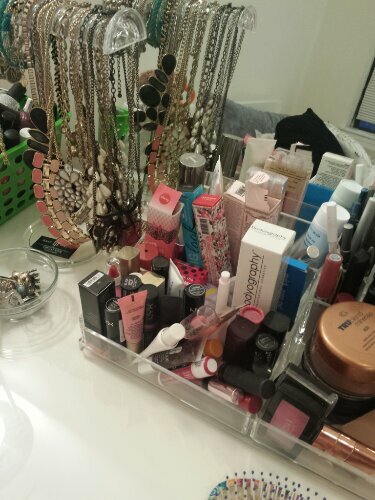 It’s funny how small my dressing table/desk can look in some pictures.. this monster is about 4 feet wide! 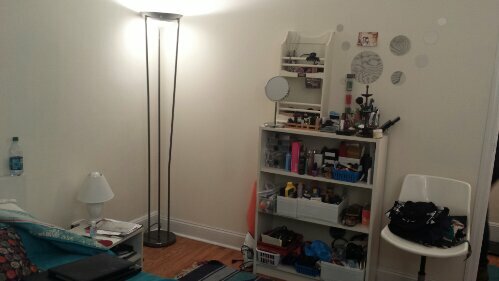 I put a bright floor lamp next to it so I would have good lighting while applying my makeup. 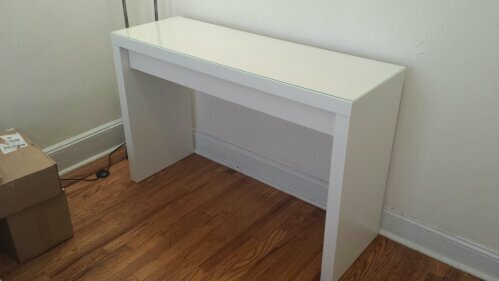 Then, I leaned a nice big 24×24 inch mirror on top of my new vanity desk, added on my jewelry stands, makeup organization, nail polish collection and few other items. Below is a beautiful gray and white chevron ottoman I purchased, and a beautiful white whicker mirror that I can move or slant if needed. 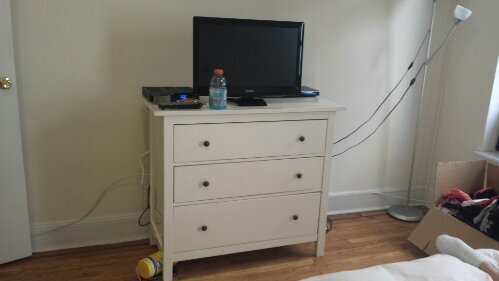 It looks so bare right now, but here is my 3-drawer dresser, along with a flat-screen TV and cable and DVD hook up. I’m looking into paintings, wall decals and other decorative items like wall shelves to put up around it. Gotta love my windows and lighting! Although the view may not be beautiful, I got a lot of natural light through these 3-feet wide by 6-feet high windows! 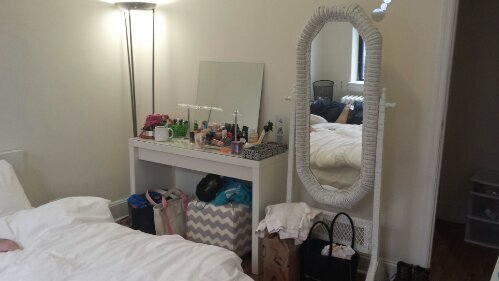 In between them I decided the create a storage space, and so I currently have this white and wicker Home Goods find and a pink storage organizer for some of my beauty items that didn’t fit on my vanity. My marshmallow bed! 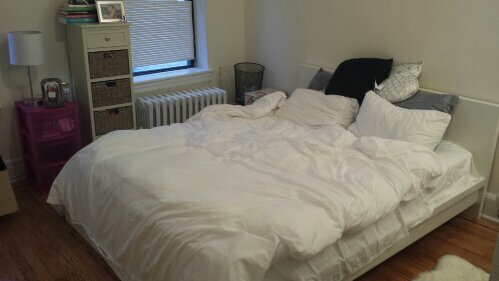 I invested in a great down duvet, plus a snow white cover, sheets and pillowcases, along with some fluffy and furry accent and body pillows. I definitely need to invest in some “Queen-sized” pillows now that I know they exist though! K approved the bed for softness and cuddliness. 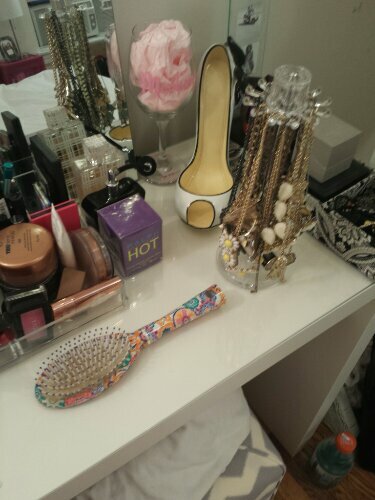 Here are a couple close-ups on my vanity… still a work in progress! 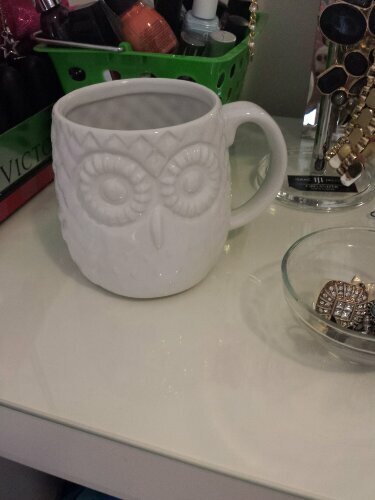 And some cute accents like this ceramic white owl mug! 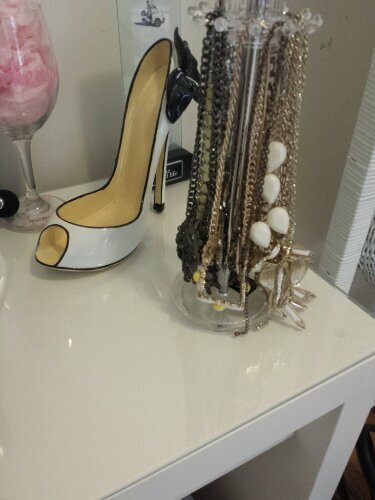 And this white and black accent shoe that’s actually a WINE BOTTLE HOLDER! Yes! It’s not 100% done yet, as you can tell by some of the assorted cords and boxes, plus the very bare walls. I’m currently looking into window drapes/curtains, artwork or decals for the white walls (I like the white, but they need a pop! 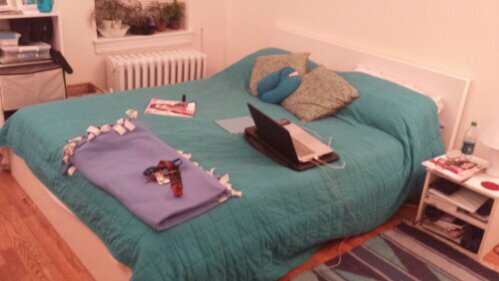 ), night-table (since mine broke during move-in) and a few extra pillows! What do you think about the changes so far? 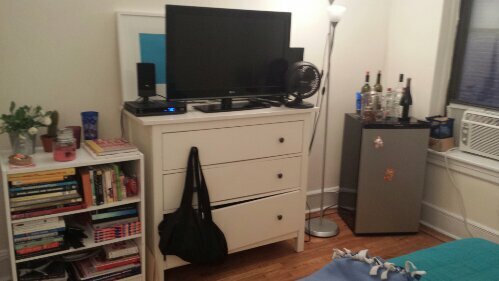 Any recommendations for decor?